The magnetic field gives us a layer out in space called the magnetosphere high above in the atmosphere. It varies in distance but can extend up to 65,000 kilometers from Earth’s surface. 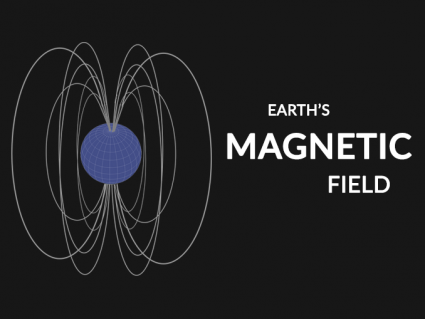 From space, the magnetosphere resembles a magnetic dipole. Field lines resonate in a circular pattern from magnetic north and south poles. During magnetic storms, trapped plasma flashes lights that are observable around the globe. This disturbance in the magnetosphere is what creates the Aurora Borealis or Northern Lights. If you go deep inside Earth, the core is almost all iron and nickel. But the outside part of it is actually liquid flowing much like water. We know this from using seismic tomography from earthquakes. 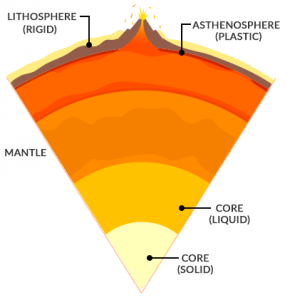 Because the solid inner core heats the outer liquid layer, it produces convection currents. 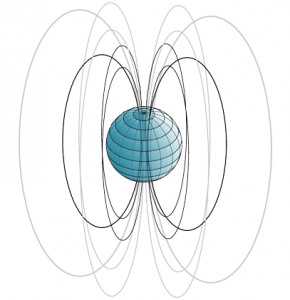 And this geodynamo is Earth’s magnetic field that we measure at the surface. Seismologists suggest that because the inner core rotates faster than the mantle, it’s this active churning that generates a geodynamo. Not only do these convection currents affect heat flow within the planet, but the magnetic field it produces plays an important role for giving life on planet Earth. Earth’s magnetic field changes with time. It’s known to wander from place to place. And it doesn’t match with Earth’s geographic north and south poles. 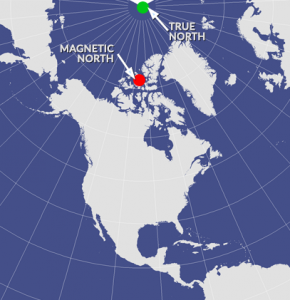 In the past, magnetic poles have reversed and even changed direction. This means that the north pole becomes the south pole and vice versa. There aren’t any patterns for magnetic pole reversals. They don’t reverse in regular intervals making them very unpredictable. Over the past 3 million years, the magnetic pole has reversed 12 times. We know this because we record reversals in iron-rich rocks that behave as magnets. Basaltic magma is rich with iron when it freezes. Because iron is magnetic, we use magnetometers to find the direction of the magnetic field. When magma cools, the magnetic material aligns with Earth’s magnetic field. As it solidifies, it locks the magnetic field orientation like a tiny compass. Based on the rocks magnetism, we can find the magnetic pole orientation. So within the first layer of basaltic lava, magnetite records the north pole direction. Then for the next layer, the south pole becomes the north pole. They found that the magnetic orientation switched in successive basaltic lava layers. And this is why we know that magnetic poles have reversed in history. Why do poles reverse? We are still trying to find the cause for pole reversals and when the next one will occur.